DO-17030-28 was succesfully added to your cart. Keeping humidity instruments calibrated helps you measure and regulate this variable more accurately. From humidity data loggers to thermohygrometers to high-accuracy handheld instruments, InnoCal® offers humidity calibrations for nearly any brand or style of meter from 0 to 95% relative humidity (RH). We are not able to give out that information as that information is proprietary. Will this calibration certificate have the A2LA logo? This is required by our A2LA auditor but we had to pay extra for this in addition to the certificate last time. The A2LA logo is an additional charge. Please add 17100-03 to the calibration order. Is there a Cal date expiration (due date)? 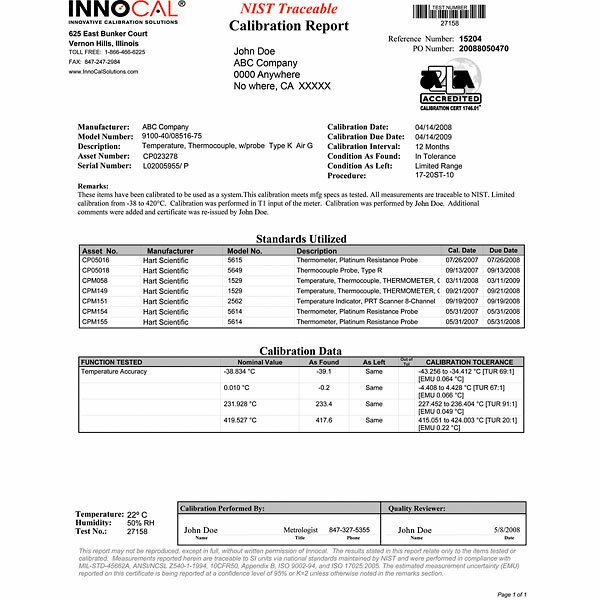 The expiration date for our calibrations are up to the end user and their requirements. A typical due date is 1 year from the date calibration was performed. No, this part number (17030-28) is for the calibration of the temperature/humidity indicator only. It does not include the temperature/humidity indicator as well. This must be ordered along with this calibration part number if you want it to be calibrated to NIST standards. This item is very easy to use. We were happy we purchased this item.